This little invention is great for the person who has to take their office with them where ever they go. 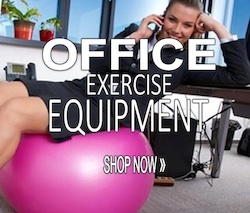 It can also be an alternative walking desk solution for someone who want to fit more movement into their day but cannot afford the money or the space for a full-fledged walking desk with a treadmill. 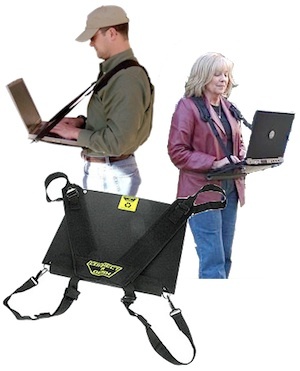 These are two styles of laptop desks designed specifically for walking and working. The Connect-A-Desk and the Floataboard (see below). Connect-A-Desk is adjustable so you can fit it for any persons size or frame. No need to worry about having to pull it on or off when you sit or stand either. It comfortably will stay in place so you can do either easily. This is an all in one desk made for the mobile laptop. The harness is washable and adjustable and the entire unit will fit snugly into most computer bags for ease of portability. The surface of the ‘desk’ is non-slip PLUS it also has a safety strap so you don’t have to worry about your laptop sliding off. 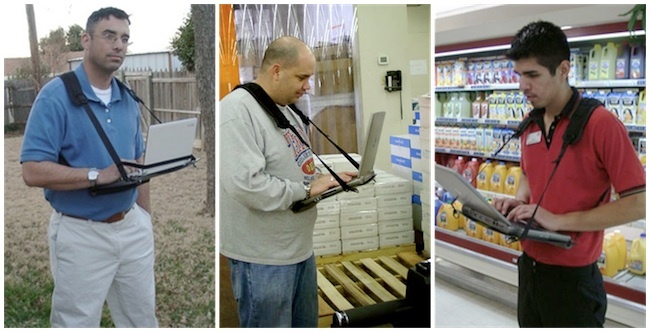 Because of it’s ergonomic design it is not only fully portable but comfortable to use as well. Never again will you have to squat or find a surface to place your computer or notebook to take notes while on the go. Now you can take your tablet or notebook into the filthiest of workplaces and never worry about having to find a clean spot to put it down. The Connect-A-Desk is the perfect tool for anyone who wants to move about their workday but can’t just leave the work behind. For those of you whose job demands they move about all day, you will love the Connect-A-Desk. Do you commute and wish you could made better use of your time on the subway? 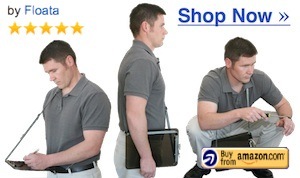 Maybe you are a floor supervisor who could use a portable desk. 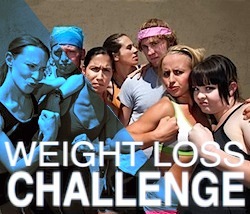 Strong and lightweight, easy to use. Are you a builder? Have you ever gone to a job site and put your laptop down only to realize it after you left? This is another invention that lets you keep working without a desk or needing a surface. The comfortable shoulder strap adjust for your size. It also adjusts for the left or right handed person. There is also the added feature of a paper holder on the bottom so you don’t have to worry about your papers blowing away. The unit can also be used so the clipboard dangles at your side so you can work with both your hands should the need arise. They are on Amazon Karl – are you looking for something different?